Remove largest basil leaves at the base of the stem. Rinse basil leaves and gently pat dry with a paper towel. 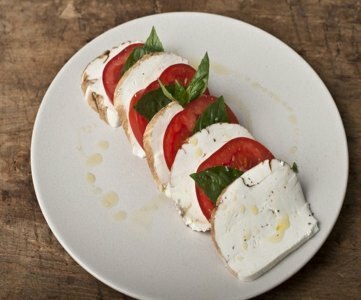 Arrange ingredients on a serving platter in the following order: 1 slice smoked mozzarella, 1-2 basil leaves and 1-2 slice tomato (depending on size). Drizzle generously with extra-virgin olive oil. Sprinkle with smoked sea salt and serve at room temperature with crusty Italian bread.